Welcome to the free practice questions for the 70-762 upgrade exam for SQL 2016. These questions were hand written with the purpose of complimenting your study material and helping you study for the real exam. The test is comprised of 15 questions which are randomly selected from a collection of over a hundred. There is no forced time limit but the simulator will keep track of the overall time taken and your final score. For most questions, there are helpful explanations underneath the correct answer, to help you understand the right choice and to learn from any mistakes. When you’re ready, simply click the "Start Practice Test" button (or link) below to begin the practice test. 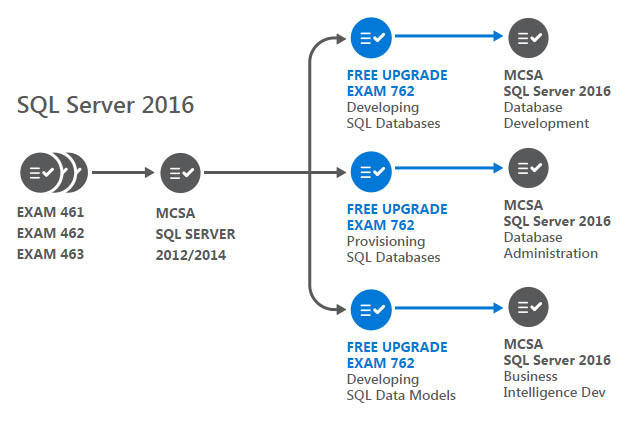 70-762 is an upgrade exam, which means you only need to pass the one exam to upgrade your entire certification from MCSA SQL 2012/2014 to the new 2016 version. Obviously this is more economically viable than taking each of the SQL 2016 exams individually, with the only drawbacks being an increase in the number of questions and the longer duration for the exam. *Alternatively you could have also upgraded from SQL 2008 through exams 70-457 and 70-458. From here, you achieve MCSA SQL 2016 by simply taking the single 70-762 upgrade exam. SQL 2016 was generally released on 1st June 2016 with Microsoft claiming that it is the biggest leap forward in Microsoft’s data platform history. Microsoft have extended the already mind-blowing scope of SQL Server in the core areas of security, data warehousing, business intelligence, advanced analytics and hybrid cloud. We now have better security features such as row level security, data masking and always encrypted. Cloud databases are still incredibly popular and with the new Stretch Database option, we now have the benefit of a local database for frequent data whilst a cloud Azure database automatically keeps track of less frequent or archived data. Always Encrypted - when enabled, all SQL Server data is seamlessly stored in an encrypted form. Dynamic Data Masking - obfuscate sensitive data from particular user roles. JSON Support - interchange JSON data between applications and the SQL Server database engine. Row Level Security - restrict user access to row level data based on filters. Polybase - query distributed datasets such as Hadoop or SQL Azure blob storage using Transact SQL statements. Stretch Database - store frequently used data locally and automatically sync less frequent data to Azure. 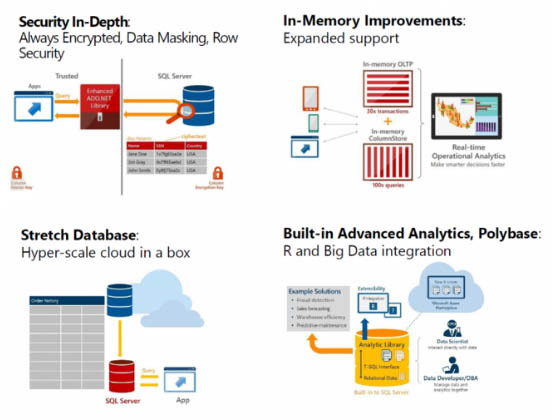 A complete set of new features can be viewed on the official SQL 2016 website. As with all upgrades, this exam encompases all of the exam material from the individual SQL 2016 exams. The three core areas covered are: Querying, Administration and Data Warehouses. A taster of the new features in 2016 are mentioned above. Many of these topics are tested on the official exam as well as in this practice test. As always, I like to stress that this site does not contain braindumps, VCE files or any other kind of dumps. These are unique handwritten questions, based on the official guidelines from Microsoft. It is always better to study for your exam rather than cheat your way through it. You’ll feel better and above all else - you’ll be smarter for it! !